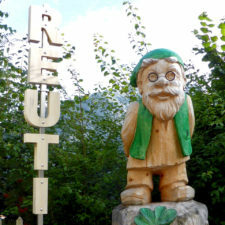 One of our favorite alpine trips in Switzerland took us to three gondola stops — Reuti, Mägisalp, and Planplatten. 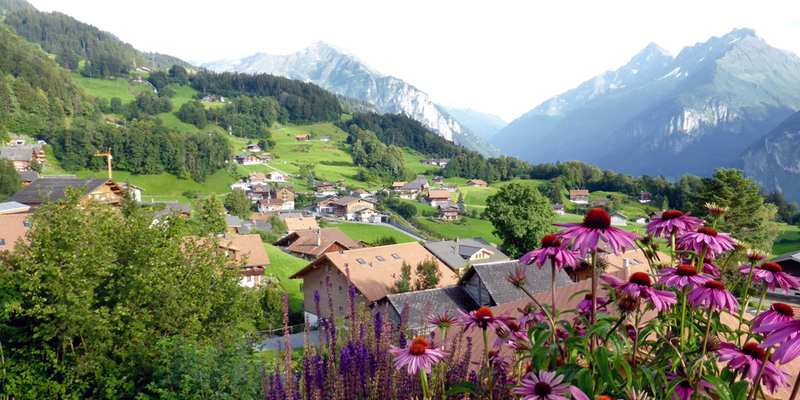 We were based in Meiringen during our Untours apartment stay. The soaring mountain and base station for the gondola ride were right behind us. 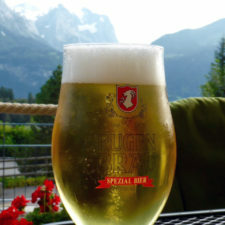 Since we each had a Swiss Travel Pass the ride from Meiringen to the mountaintop was half price. On birthdays it is free. We rode through forests, past gushing waterfalls, over chalets on rolling hills and to the alpine summit terrain. Mountaintop trails the Hasliberg mountainside are popular with hikers. 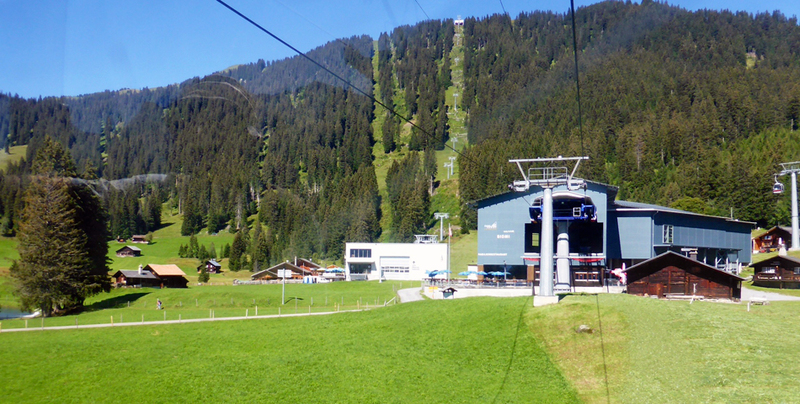 The first cable car runs from Meiringen to Reuti. Lunch or dinner at one of the restaurants there come with a mountain view. But we were headed to an even more spectacular heights. 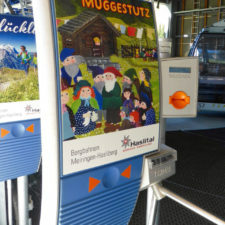 Bergbahnen Meiringen-Hasliberg, the gondola railway, continues from there to Bidmi and Mägisalp. 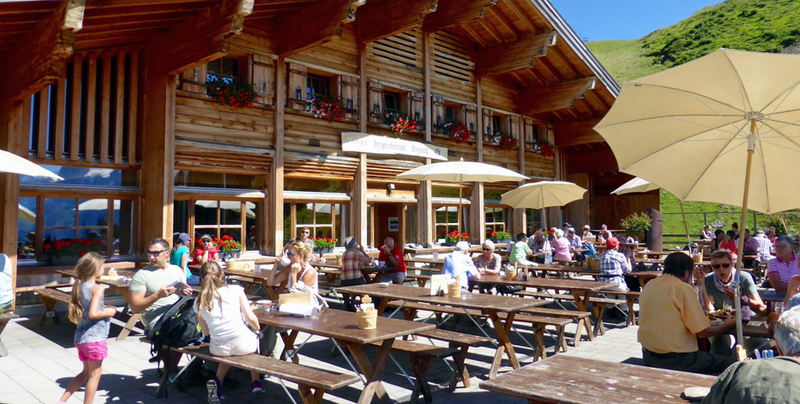 Families with small children disembarked at Mägisalp. Hands-on theme trails there run through woods and meadows. 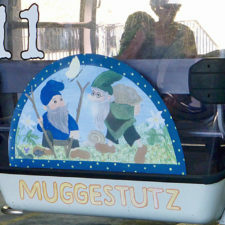 Sites follow the magical story world of Muggestutz, the oldest Hasli dwarf, and his friends. There are playground and picnic areas, restaurants, adventure stations, and reminders of the stories like a swing bridge and cave. Trotti Bikes, a kind of scooter, can be rented to ride from there downhill to Bidmi. The return is by gondola. However, we were headed higher and took the third gondola to Planplatten. 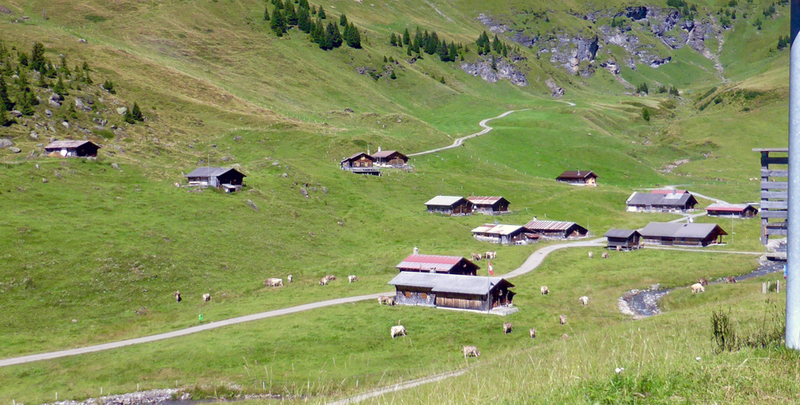 While we ascended to the summit the sound of cowbells serenaded us as we passed alpine huts and summer pastures. 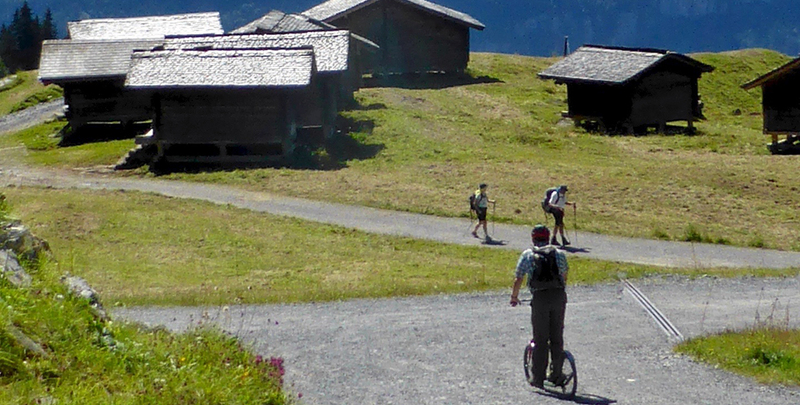 Soon we disembarked at the summit to take in the breathtaking view of over 400 peaks, the valley, and Lake Brienz. 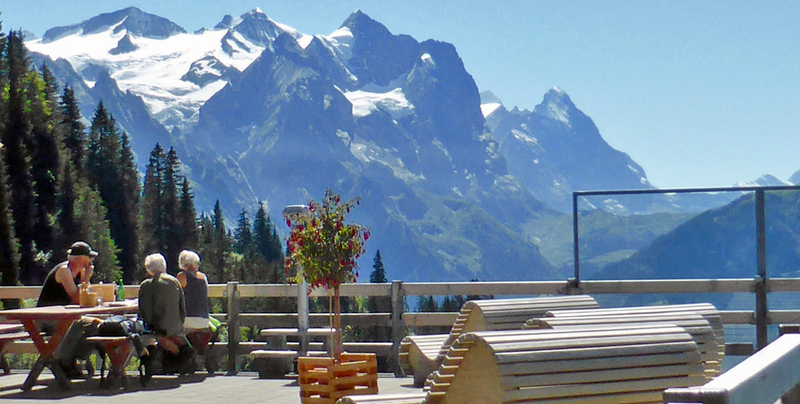 Lunch came with a view at the panoramic Alpen Tower. This is also a popular spot for Sunday buffet breakfast. 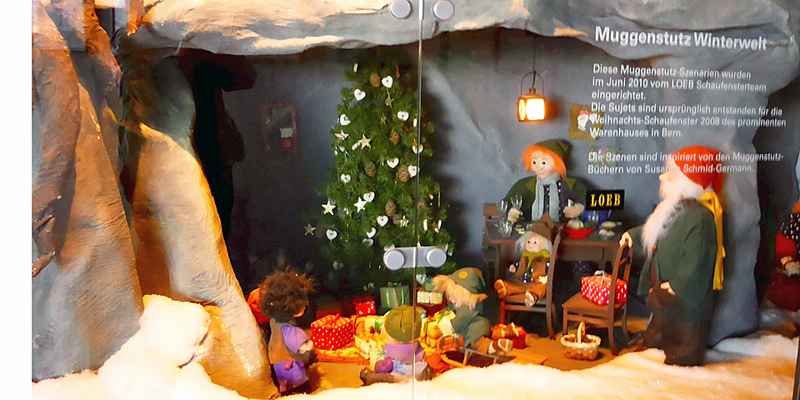 As we entered the restaurant building we discovered a room of Muggestutz Winter World displays based one of the books. A display of mountain crystal was by the entrance to the restaurant. There was also a book by Kaspar Fahner told of the wonderful world pf crystals. 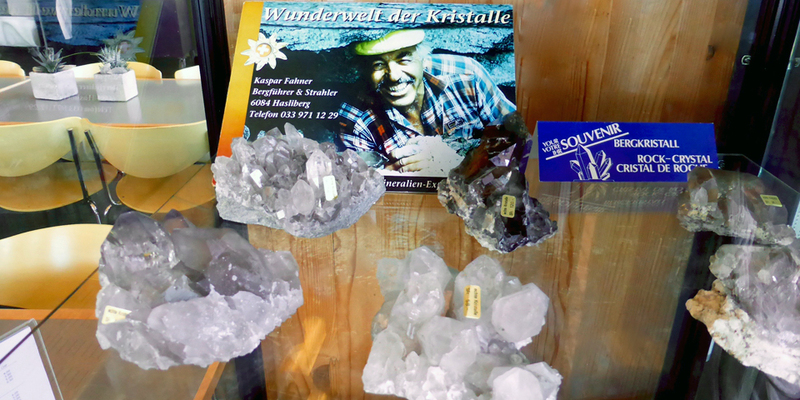 His Wonder of Crystals exhibit at Fahner Sport in Hasliberg features one of Europe’s top mineral collections. Entry is free when the crystal shop is open. We were nearly 7400’ above sea level and had a breathtaking 360 degree view of the Bernese and Central Alps. Low-lying wildflowers lined the easy highland paths. But don’t step on the tiny alpine bees! If you go, be sure to check the television broadcast of weather conditions at the summit before making the trip. Also be sure to note the time of the last gondola back down. 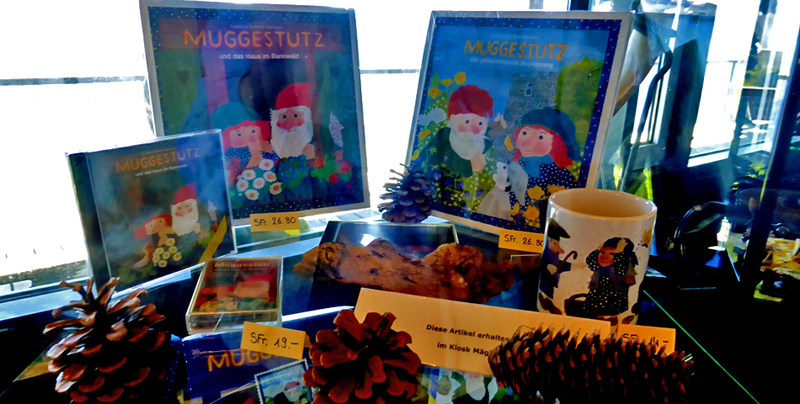 Back in Meiringen, we found English versions of Muggestutz books for our granddaughter at the Jenny & Banholzer bookstore.